Once upon a time, there was an actual transmitter at Transmitter Park (the park to be at the base of Greenpoint Avenue). The transmitter was for WNYC, which was then a City-owned radio station. The station still exists (AM 820, FM 93.9 and online), though it is no longer owned by the City and it no longer uses the Greenpoint transmitter site. WNYC’s Archives & Preservation project has a post about the Greenpoint transmitter, including two paintings by artist and architect A.G. Lorimer (no mention of whether or not he was related to the Lorimers of Greenpoint). 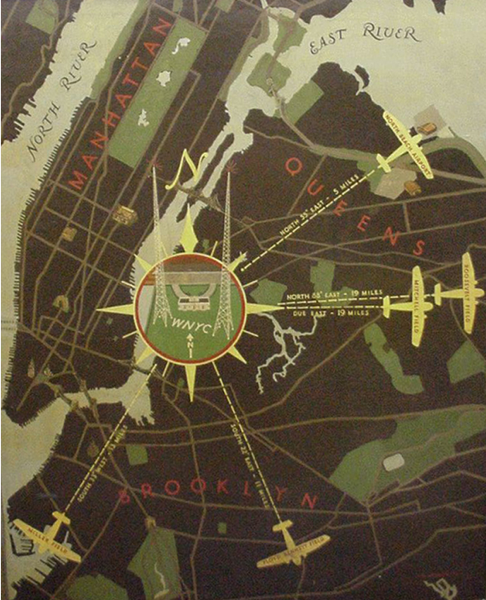 The image above shows Lorimer’s gorgeous map of the transmitter site, complete with distances to five local airfields (all of which, with the exception of North Beach (aka LaGuardia Airport), are now closed). The second painting, a view of transmitter building and towers, can be seen on WNYC’s site.